Eight bloggers, five bars in six hours and a trolley. 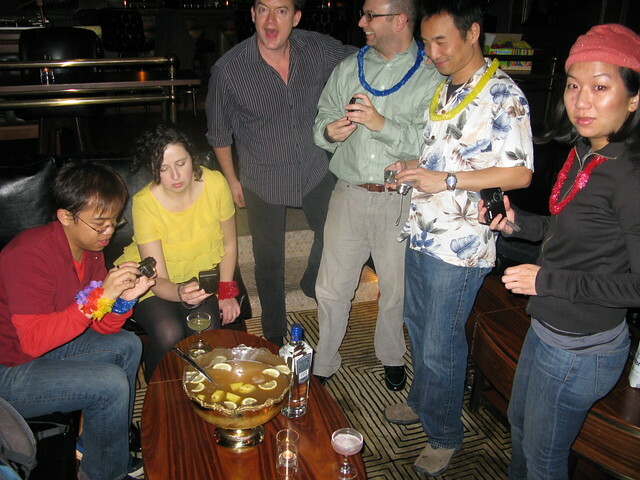 That was what will heretofore be remembered (barely) as the Blogger Barhop 2011. Thanks to our generous sponsor Plymouth Gin, host Erick Castro and ringmaster Aidan Demarest, it was a night of nonstop boozing, bad behavior and excellent cocktails. Now, this wasn’t just another media event, this was partly my event. Inspired by Aidan’s bar 1886 being way the hell in Pasadena, I resigned myself to the fact that the only way I could ever really enjoy drinking there is if I had a driver. Naturally since Aidan has had a hand in several of LA’s well-respected cocktail establishments, I figured a barhop touring some of his bars was the way to go. Throw in a liquor sponsor, transportation and cocktails and we were all set. Wayy easier than Blogger Prom. Anyhoo, the night started at Aidan’s latest venture, the Spare Room at the Hollywood Roosevelt, where he unveiled his barhop game. We bloggers had to log the drinks we had at each bar; full drinks, not sips, which had to be verified by the attending bartender. Oy. The goal was to finish 30 cocktails and the blogger to achieve that crazy feat would win…no, not a brand-new liver, but rather a round of bowling at the Spare Room. Back at the Spare Room, while some of us took advantage of the bar’s two bowling lanes as well as the finicky photo booth, everyone enjoyed host Erick’s special cocktail he calls LA Christmas: Plymouth Gin, pineapple gum syrup, velvet falernum, Earl Grey tea, lemon juice and spices. He said the spices remind him of winter but as it’s served over ice, it’s really more appropriate for LA during the colder season. This was a very light drink and went down way too easily, just wetting my whistle and leaving me open for the next cocktail, the bar’s own Spare Room Snap: rye, gingersnap liqueur, lemon and nutmeg. I LOVE this drink — spiced, frothy, potent. Next up was an off-the-menu cocktail called You Drink Our Milkshake with vodka, cream, coffee liqueur, cacao. Basically a version of the White Russian. After this, my third cocktail in less than an hour, all careful note-taking, detailed Tweeting and documenting every drink I consumed went out the trolley window. So I will attempt to put the pieces of the night together by way of our tweets we hashtagged #bloggerbarhop. Me: OH Aidan: I can pour champagne while driving the Indy 500 #bloggerbarhop: Aidan was good enough to pack a cooler of champagne and beer for the trolley. 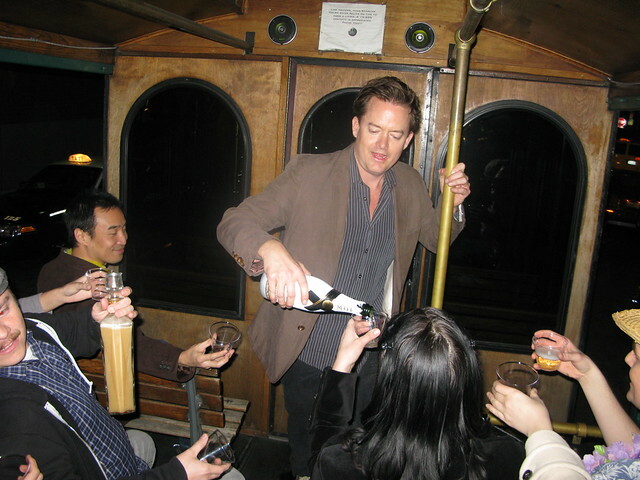 And once aboard he proceeded to pour us champagne while the trolley headed out to our second stop at Big Bar in Los Feliz. Me: We’re woo hooing and wearing leis. 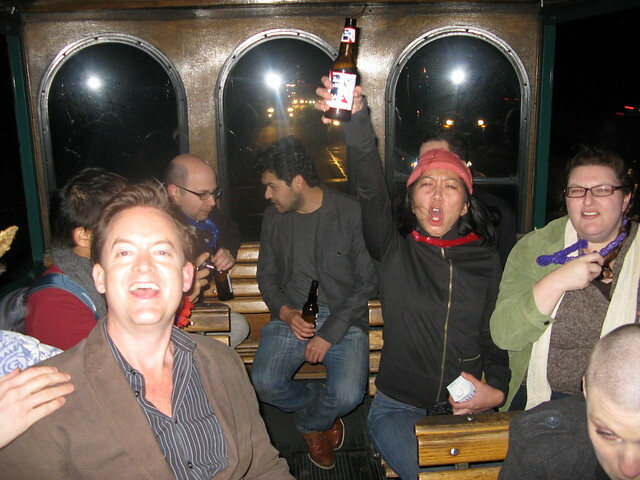 We’re assholes #bloggerbarhop http://flic.kr/p/9eMiaf: We were riding down Hollywood Boulevard in the back of the open-air trolley, yelling at passers-by and motorists and trying to pick up randoms. Lindsay: On a sightseeing trolley getting sloshed rolling thru east Hollywood. We might get shot at tonight. 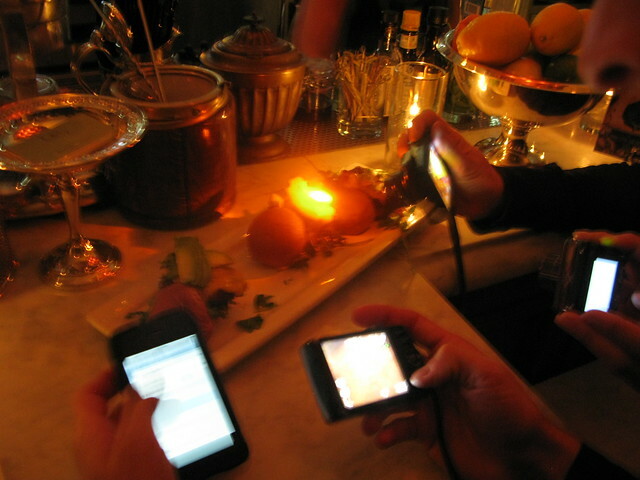 #bloggerbarhop See the previous tweet. Food GPS: #BloggerBarHop Stop #2: @bigbarlosfeliz Merry Widow cocktail, and why have I not had the bacon wrapped, goat cheese filled dates before? We had some amazing nosh at Big Bar. OMG that bacon-wrapped, goat cheese filled date. Bite-size sin. LA/OC Foodie: Omg, 2nd stop leaving @bigbarlosfeliz and we are drinking pbr on the trolley #bloggerbarhop Yes, it’s true. Although, since the trolley booze didn’t count with regards to the game, I didn’t have any, except a cup of champagne. Me: No liability on this bus. If u fall off tuck and roll – Aidan #bloggerbarhop The fact that there were no ropes cordoning off the steps into the trolley, earned our ride the nickname: Trolley of Death. Lindsay: On our way to the Varnish. Passing a bottle of Figgy Smalls. Literate tweeting is not likely. #bloggerbarhop Unfortunately I missed out on this Figgy Smalls, bacon-washed bourbon, since that went to the poor souls who sat in the open-air part of the trolley while it was on the 110 going to our fourth stop at the Varnish. Riding the Trolley of Death. Me: Manhattan by Marcos at the Varnish #bloggerbarhop. I know it’s not #Plymouthgin http://flic.kr/p/9eKT7a but I loves it. Naturally I had to have one and even after all those other cocktails it hit the spot. I think this was my last cocktail of the evening. LA/OC Foodie: Pitstop for burgers and fries #bloggerbarhop (@ Original Tommy’s Hamburgers) http://4sq.com/h96NHX Yeah, that happened. I actually ate one. Aidan bought a bunch and brought it on the trolley. I vaguely remember thinking at the time that it was the best burger I’ve ever had in my entire life. Lindsay: Back at Spare Room; waded thru sea of douchebags on steps 2get in hotel. Dancing to “ironic” retro grooves. I’m done drinking #bloggerbarhop We were all done drinking at this point. The Spare Room was surprisingly packed for a Monday and we didn’t want to deal anyway. Apparently HC stayed for a mocktail, Elina and Savory Hunter had stayed behind on the trolley to help the driver clean up the post-Tommy’s Burgerpocalypse, Schmexaminer guy went to pass out in his car and Thirsty and I crashed at Estar’s, who by the way won the game by scoring extra credit for sitting in the back of the trolley while it was on the freeway. Congrats, Estar! Damn, last night was a blast and thank goodness for Twitter else I think many of us wouldn’t have really remembered it. Again, huge thanks to Aidan, Erick and Plymouth as well as Naomi Schimek, Marcos Tello and the other bartenders for being so gracious and taking care of our drunk asses. Thanks! Yes, I have the pics that prove you were there. I don’t know about soon, but I def want to do it again. Maybe next stop: Vegas? Fun recap of a memorable night. Well, I remember most of it. I’m so glad you got home safely. You just up and left the trolley! For me, jumping off the trolley was kind of like the scene at the end of One Flew Over the Cuckoo’s Nest where the mental patient broke through the glass window and wandered off into the wilderness. Only I had a Tommy’s burger in hand. This was hilarious. And Food GPS – dude, that’s a funny damn mental image. But thanks for the invite and putting in the effort and liver damage for the cause. This crawl prompted me to get off the circuit, though. 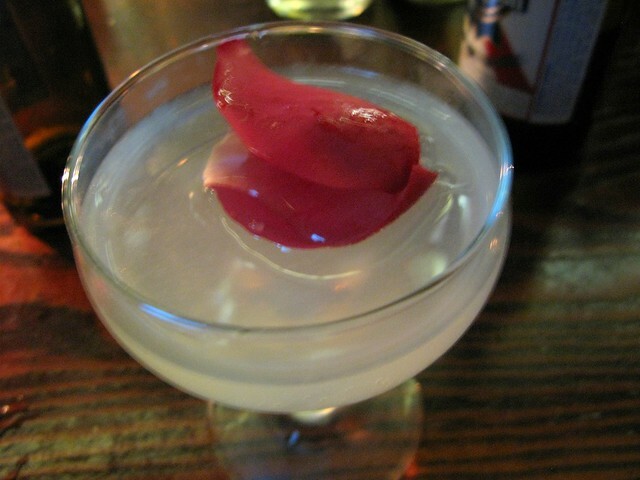 I’m going to wind down my cocktail blog and leave the scene to my betters. Cheers! I guess your definitions are different from everyone else’s on the barhop, too. Honestly, it just surprised and disappointed me what happened because we all drink regularly and write about it so there are unspoken rules of conduct, especially when peers and sponsors are concerned. And frankly our hosts were not too happy with what happened either. But please take care of yourself and good luck with everything. 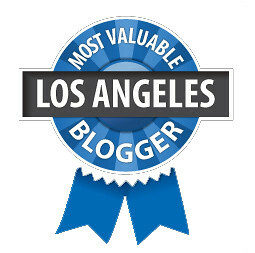 Caroline on Crack | Who Makes the Best Mai Tai in All of LA?